Many plant species will only produce flowers and fruit in regions with a cold winter. This is because of a process known as vernalization. Apple and peach trees, tulips and daffodils, hollyhocks and foxgloves, and many other plants wouldn’t produce their flowers or fruit without vernalization. Keep reading to learn why plants need vernalization. What is Vernalization in Plants? Vernalization is a process of going dormant in cold temperatures, which helps certain plants prepare for the following year. Plants that have vernalization requirements must be exposed to a certain number of days of cold temperatures below a certain threshold. The required temperatures and lengths of chilling depend on the plant species and variety. This is one reason gardeners need to choose plant varieties that are suited to their climate for the best results and the healthiest plants. After vernalization, these plants are capable of flowering. In years or regions in which the winter does not provide enough chilling time, these plants will produce a poor crop or, in some cases, they will not flower or produce fruit at all. Many types of plants have vernalization requirements. Many fruit trees, including applesand peaches, require minimum chilling times each winter to produce a good crop. Too warm winters can damage the trees’ health or even kill them over time. Bulbs like tulips, hyacinths, crocusand daffodilsneed to be exposed to cold winter temperatures in order to flower, and they may not flower if grown in warmer regions or if the winter is unusually warm. It is possible to induce some bulbs to flower at other times of year by storing them in the refrigerator for several months to imitate a winter chilling period. This is known as “forcing” the bulbs. Biennial plants like hollyhocks, foxgloves, carrots, and kaleproduce only vegetative growth (stems, leaves, and roots) during their first year, then produce flowers and seeds after vernalization over the winter. Of course, in the case of biennial vegetables, we usually harvest them in the first year and rarely see the flowers. Garlicand winter wheat are planted in the fall in advance of the following season’s growth because they require vernalization under winter temperatures. If temperatures are not low enough for a sufficient period of time, the garlic will not form bulbs and the winter wheat will not flower and form grain in the following season. 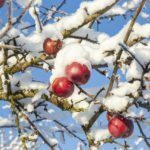 Now that you understand why plants need vernalization, maybe you will look more favorably on cold winter temperatures – you’ll know that they will soon be bringing you better springtime flower displays and more abundant fruit crops.